iPhone 4's New Motion Controls: Will It Mean Better Games? The new iPhone 4 is also a new type of game controller, with a built-in gyroscope giving the phone (and sometimes games device) better sensitivity for more motion gestures. Apple says the addition will offer "an even better gaming experience." That's debatable, but it will, also according to Apple, detect user acceleration, angular velocity, and rotation rate. The iPhone 4's implementation of six-axis motion control gaming puts it conceivably on par with Sony's DualShock 3 motion-sensing controller, although the two devices use different technology to achieve their respective levels of precision. The DualShock 3 and its predecessor, the PlayStation 3 Sixaxis controller, use a piezoresistive acceleration sensor to detect acceleration and motion. The iPhone 4 uses a new three-axis gyro in tandem with the device's built-in accelerometer seen in previous iterations to achieve its new level of precision. Similar to the Wii MotionPlus, it's a gyroscope sensor powered add-on—only the iPhone's take offers an extra axis to the Wii MotionPlus' two-axis tuning fork gyroscope. 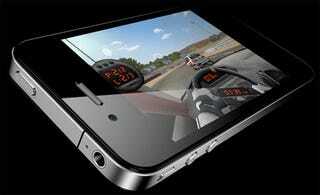 Will the iPhone 4's gyroscope sensor mean a better gaming platform? This is pretty much a given. Adding extra precision to the iPhone's sometimes wonky tilt-sensing capabilities can't hurt. Without physical buttons or joystick, game developers are reliant on tilt-control schemes or virtual controllers, neither of which are ideal. But some games make smart use of the iPhone's built-in accelerometer, like Rolando, Asphalt 4, Doom Resurrection and Super Monkey Ball. If you've played any of those titles, especially the ones that require the player to move in a 3D space, there's clearly room for improvement. But will developers support it? With tens of millions of iPhones and iPod touches in the wild, designing a gyroscope-supported game specifically for the iPhone 4 market may not make financial sense for a while. Looking at the Wii market and the relatively small number of games that support the Wii MotionPlus peripheral might be a good indication of how well gyroscope controls will catch on. The same for the PlayStation 3 and the number of games that rely on or proudly promote their Sixaxis control capabilities. Developers can and should update their tilt controlled games to take advantage of the gyroscope sensor-powered iPhone 4. Driving games and first-person shooters that rely on tilt controls can only benefit from the upgrade, as should the user experience. The control upgrade also offers a new opportunity to bring new types of games to the iPhone platform. Better flight simulators, gesture-controlled games, and software that we're not in a position to design or conceive of. iPhone 4's motion-control tech will likely lead to some interesting third-party developed applications, not just related to gaming. For better or worse, Apple is setting a precedent with the iPhone 4. Portable gaming is a big deal on the iPhone and this level of motion control in our devices could become just another expected feature. Nintendo has flirted with motion controlled portable games (Kirby Tilt 'n' Tumble, WarioWare Twisted!) in the past and is rumored to implement them in its next handheld. Will the Nintendo 3DS and future versions of the PlayStation Portable follow suit? That's a likely scenario, as is a world in which the iPhone, DS and PSP see more multiplatform releases and ports, if there's a more universally accepted control scheme that relies on touchscreens, built-in cameras and motion controls.